So… this is the other reason I have been so quiet these last few weeks, in terms of new releases! I’ve been streamlining my sculpty workflow (so I can make MORE HAIR), and creating a new HUD system to use with my hair range, that will allow me to set the styles as modify, and allow *you* to choose which colours you want, rather than take from my presorted packs!! I am *very* excited and nervous to be launching this at the Hair Fair this year! I hope you will like it too! I have 5 new styles available at the Hair Fair this year. 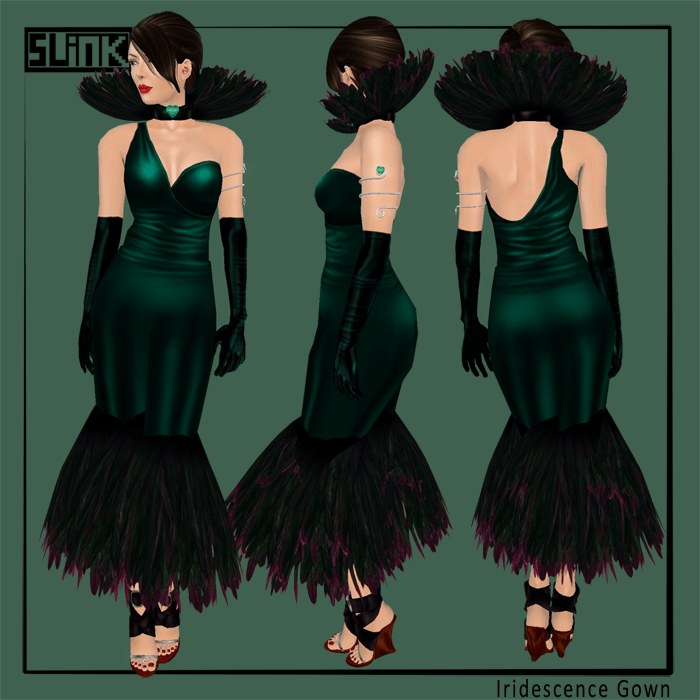 They are all very pretty, feminine and classic SLink. Demos are now available for you to try out at SLink!! Fullprice hair packs will be available at the Hair Fair from the 20th. Alethia is my special style. I made this 2 months ago and I just kept adding prims and prims until she coudn’t take any more! I love how this turned out with it’s curls, and metal and chains and coins. Definitely something different for me! 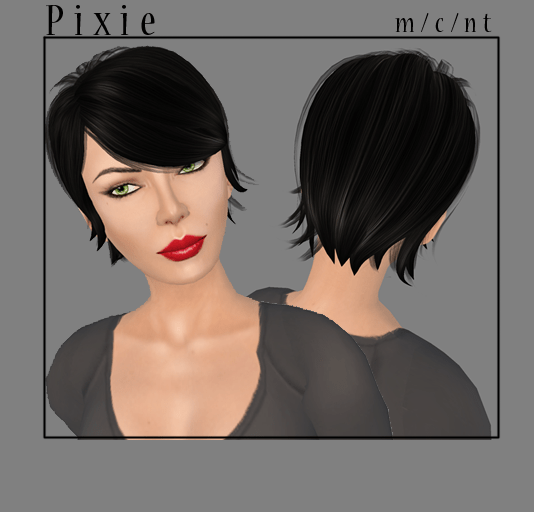 Pixie is a short and sweet style, nothing really to say about Pixie other than this is my go to style in RL when I need a short, professional look 🙂 It’s cute, and funky while still being functional and neat. Pixie and Alethia will both be donating 50% of proceeds on all boxes to the Locks of Love charity. Kimiko is a cute little Japanese girls style, pigtails just above and behind the ear, neatly parted in the middle, with a heavy long fringe. 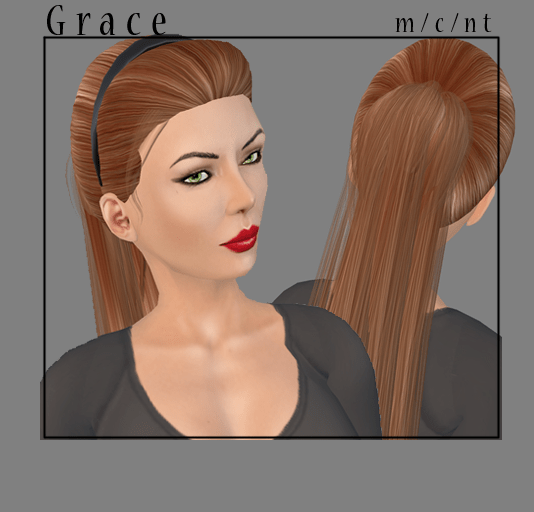 Grace is a very, *very* long, elegant ponytail, named after a very long, elegant woman who I used to work with. An alice band on the head holds the stray hairs in place. 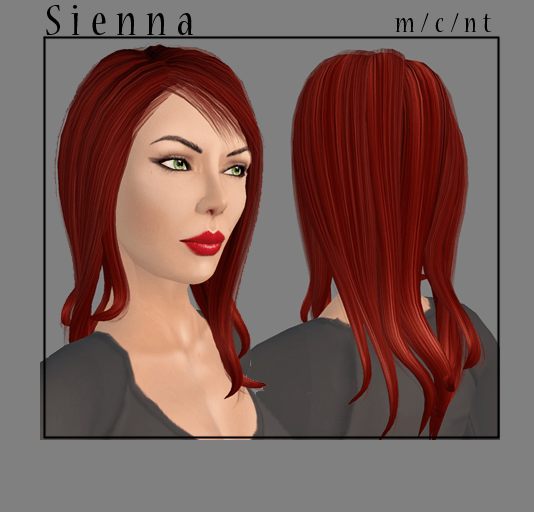 Sienna is the classic, simple mid length style. A little bit of movement is depicted in the strands, and a very light fringe frames the face. Don’t forget the One of a Kind Silent Auction happening Sunday at 12pm. First up a lovely organza frock, perfect for an afternoon garden party, but not the variety where you pull up weeds and haul loads of soil, you know the kind where you sip cocktails and nibble on vegetarian samosas. This cute knee length frock has a multi layered skirt which swishes beautifully when you move, and is embellishied with lace around the midriff and waist, and a spray of orchids at the shoulder. I was creating this dress while my dearest husband was listening to Top Gun clips on youtube. 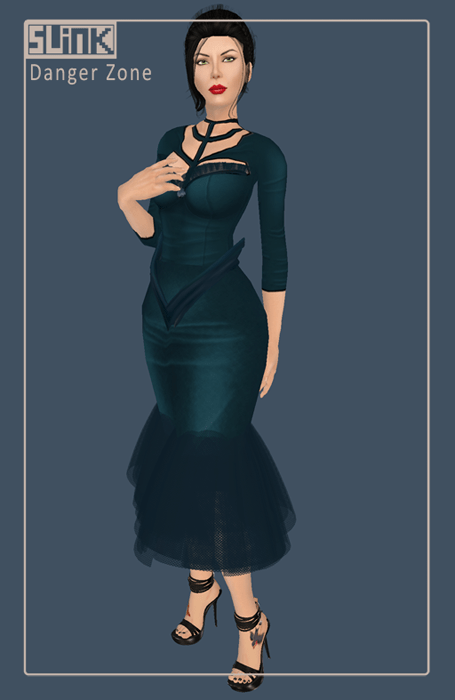 *woe* Anyway, onto the dress itself. This dress has 3 different skirt options, a short mermaid tail, long mermaid tail and a long skirt from the waist which can be worn with the long mermaid tail for a fuller look. The bodice features a cool cutout design and little frill to enhance and draw attention to the bosom, and there is cool scifi inspired flare at the hips to add to the interesting silhouette. The final creation I made for Fashion Expo is the Black Widow. This is a very classic goth inspired dress, complete with crushed velvet, tulle and lace trim on the underskirt, collar and flared cuffs. The box also contains a tulle cowl (not shown below) which brings the neckline of this dress up under the chin. New releases exclusive to Fashion Expo 2009! First up I thought I would show you the piece I have created for the One of a Kind Silent Auction. This piece is called Iridescence, and is a gorgeous green asymmetric gown, the skirt coming to knee length and hemmed with a spray of green iridescent feathers. The feathers are repeated in the wide collar which is finished with a green gem at the throat. The same green heart-shaped gem reappears on the little twisted armband. A pair of Opera length green satin gloves finishes the entire outfit. I tried several different concepts before I came across this one, and I am pretty pleased with how it came out in the final product. This piece is ONLY available as an Auction piece at the RFL Fashion Expo One of a Kind Auction. More information here. 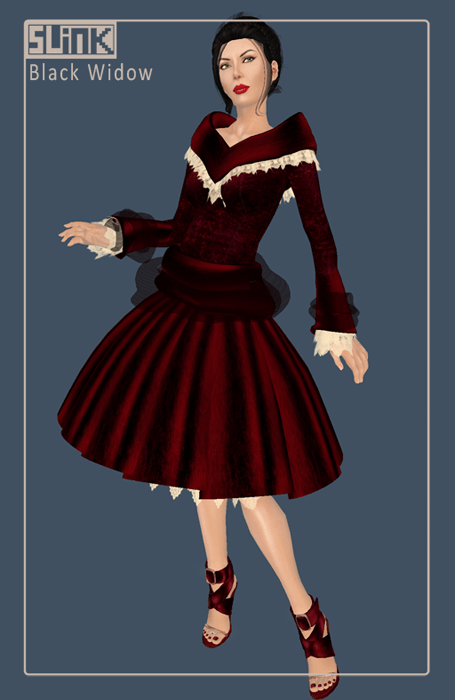 The first of the 5 frocks I would like to show you today is one of the RFL vendor styles. This is a gorgeous Grecian gown and I’ve made it in 5 beautiful pale colours. The silver version is the one in the RFL vendor. Donate the suggested amount to the vendor to receive the gown! You should see how this beauty moves, it’s very sensual and graceful. This floor length gown has a heavily jewelled collar which almost sent me around the bend placing all the little sparkly gems, and hanging from the collar, more swathes of gorgeous soft fabric to the hem. The back is finished with a row of little pearlescent buttons. This piece is currently only available in my FE booth! It will be available at SLink at the conclusion of the Expo. The second piece in my RFL vendor and only available at the Expo for the time being is this cute little vintage style cocktail shift. This dress can be worn with or without the prim pieces for a number of different looks. The jewel collar drops down into the low neckline of this dress with 3 rows of white gems and 3 little rose coloured drop beads – the neckline is low and wide in both front and back in a very 1950’s classic style. The skirt is straight and ends just below the knees. I have just popped a lovely new barefoot on my wall at SLink. This is the Pearl Barefoot, absolutely perfect for the bohemian or beachy bride who doesn’t want to constrict her feet in regular shoes for her special day! Also great for Fae folk and even slavegirls. These feet have a lovely simple freshwater pearl adornment, wrapped around the ankle and second toe, little tiny metal beads accenting the freshwater pearls on the bridge of the foot, and pearl drops on little precious metal spirals. Come and try on a demo today! 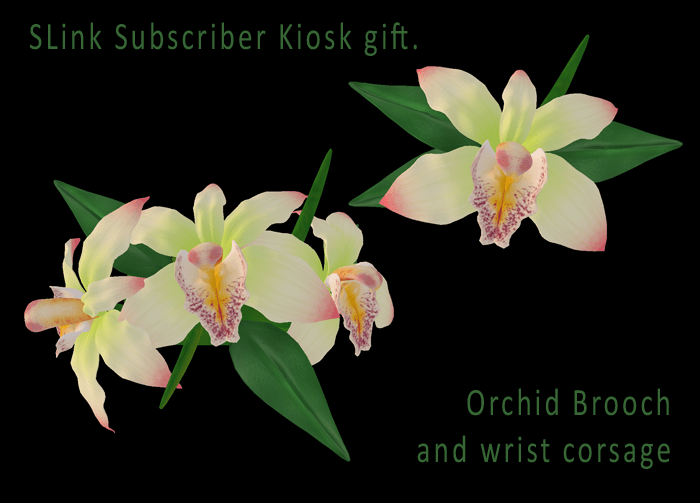 If you are a member, and you missed it for whatever reason, you can get it by unsubscribing and resubscribing to the kiosk. Alternatively, get it from my group notice history!